Or the melanin-lacking, hirsute "Super-Predators", the colonizers aka settlers, gold hungry westward bound savages, who tried in vain to kill off the once mighty buffalo that roamed the plains in great numbers. In a poor effort to starve off the original inhabitants. Why does this make me think of the nearby Sasquatch post? LOL, dmarks. Actually, there's plenty of evidence of it. Mostly it's fullerenes (hydrocarbons consisting of spheres made of benzene rings), which aren't found naturally on Earth; and the platinum group of metals, which are, as the name implies, very rare. Also, this extinction event occurs more or less simultaneously throughout the Northern Hemisphere. 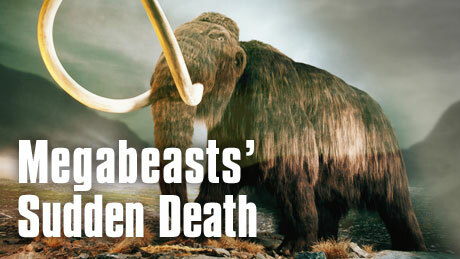 The old theory, of human-driven extinction, was largely based on places like New Zealand and the Canaries. In addition, while denying a Pleistocene human presence, they blamed humans for the destruction of species that hadn't been seen since 40 kya, such as the Aztlan rabbit. Actually, the Smithsonian's Encyclopedia of American Indians has a good refutation of human-driven extinction. It's just obvious to me that human beings are hard on nearby animals. Large concentrations more so, smaller concentrations (a few nomads) less so. Regardless of whether or not it is Natives involved. I'm just saying. Also, you've got to wonder how much of it is based on evidence, since most of the people who believe in a human-caused extinction are still in the "Kennewick man was WHITE!" camp. Personally I say that if Kennewick man was white, the Olmecs were black. Both sets of idiots use the same methodology. "Personally I say that if Kennewick man was white, the Olmecs were black. Both sets of idiots use the same methodology. " And don't forget the racist "new ager" Shirley MacLaine, who argued that space aliens had to have made the old Inca buildings. Of course, because to her, pre-Columbian natives were too primitive and savage to have piled rock blocks.